David Mamet is, of course, one of America’s foremost dramatists. He was highly respected by critics until he came out as a conservative a few years back. Since then many have discovered that he has no talent at all. Still, he perseveres, and he has written a book about Politics, The Secret Knowledge, to explain how his mind has changed on a number of issues and to provide a few glimpses into his personal pilgrimage. I don’t agree with all his opinions, but the book was fascinating to read. The title is paradoxical. 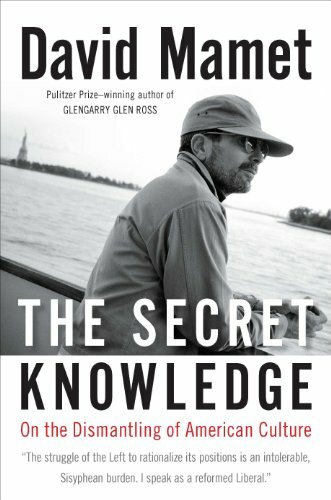 There is no secret knowledge, Mamet informs us. The basic truths of life are widely known by all people, even (or especially) the extremely unsophisticated. It is the intellectuals and the avant garde who reject obvious truth and embrace nonsense, to which they cling desperately, because their adherence marks them as among the Enlightened. Any review is likely to devolve into commentary on Mamet’s actual beliefs, either approving or condemning them. So I’ll content myself with providing a few choice quotes – of which there are many. I think I may have highlighted about a third of the text. Writers are asked, “how could you know so much about (fill in the profession)?” The answer, if the writing satisfies, is that one makes it up. And the job, my job, as a dramatist, was not to write accurately, but to write persuasively. If and when I do my job well, subsequent cowboys, as it were, will talk like me. I examined my Liberalism and found it like an addiction to roulette. Here, though the odds are plain, and the certainty of loss apparent to anyone with a knowledge of arithmetic, the addict, failing time and again, is convinced he yet is graced with the power to contravene natural laws. The roulette addict, when he inevitably comes to grief, does not examine either the nature of roulette, or of his delusion, but retires to develop a new system, and to scheme for more funds. The greatest endorsement of my Grandparents’ immigrant generation was, “He is my landsman.” Which was to say, “He comes from my shtetl and my lodge (my culture), and I can, thus, predict how he will act.” This is not to say that the landsman was perfect, or that the prediction was infallible, but that, sharing a culture, one could take a large amount of energy which otherwise would have been expended on self-defense, and utilize it more productively. The human body is 55 to 75 percent water, and an equal percentage of our endeavors, after food, clothing, and shelter, are nonsense. I play soccer with my dog, but I cannot fool her, for she cares nothing about my elegant and deceptive movements; she is only looking at the ball. The Secret Knowledge is a long book, and one that requires much thought. I benefited from reading it. Highly recommended. I can count on this blog to regularly point out good stuff I’d never find on my own. Totally agree. Two Mamet works I recommend: The Spanish Prisoner with Steve Martin. Unusal for Mamet this film is profanity free. It is loaded with plot twists and turns. Great effort. Spartan with Val Kilmer makes up for the profanity. A highest level story of kidnap, betrayal, and inter-agency corruption. Great performance from the often troublesome Kilmer. Roger Ebert highly praised this film that was a box office flameout. Here’s a link to an essay on when Mamet first announced his change of heart.